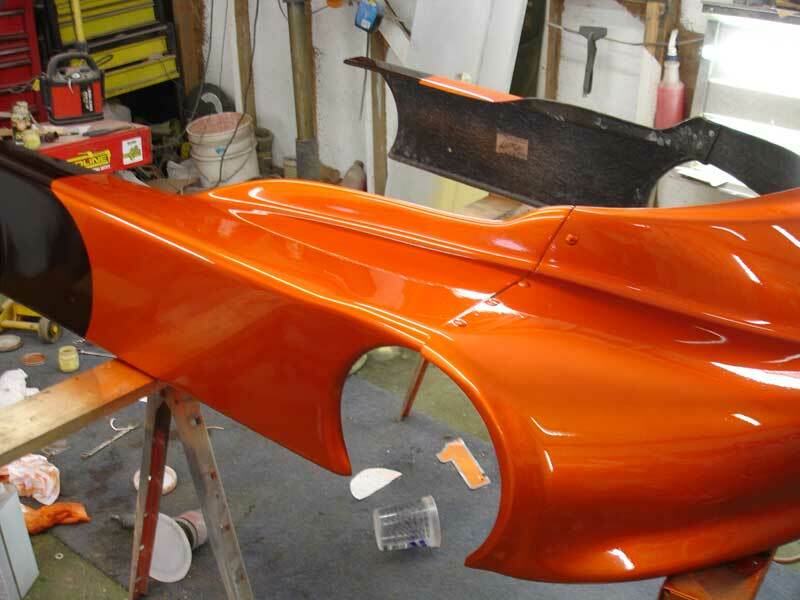 Kustom Paint Jobs with our products. 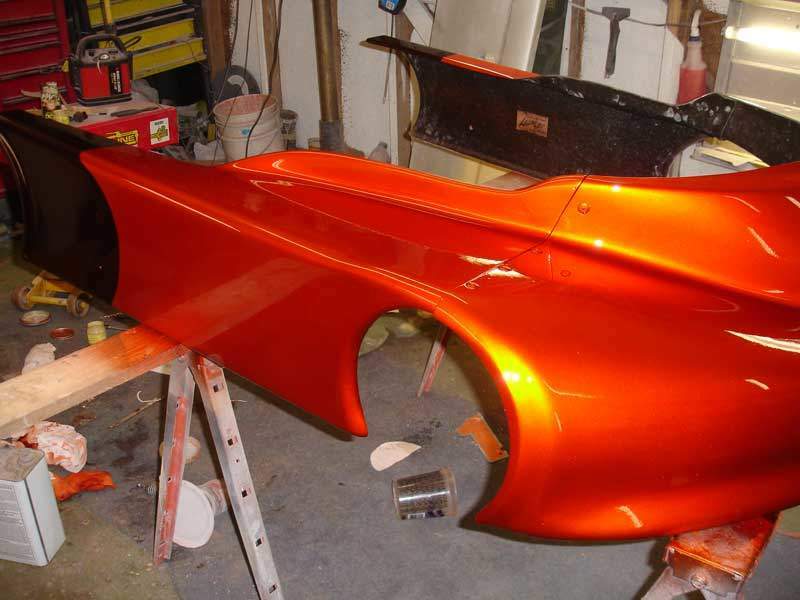 When Kustom Paint jobs look their best, is when people understand more about what makes them professional, and what makes a custom paint job look amateur. A good thing to remember is using warm tones with cool tones can often turn out bad. A few years ago, one of the car companies made a light blue car, and put an gold “spectre pearl”, on top of it. This made a difficult color to look at that no one wanted to buy. When you look at warm tones, it makes sense to use them over other warm tones. Take this 55 Chevy fender, for example. It was painted dark orange, and had a nice Gold Spectre Pearl over it. Spectre pearls differ from Kandy Pigments, as the actual particles of spectre pearls are transparent, and only reflect color in the sun. We also like all kinds of Reds and Purples shot in different combinations. 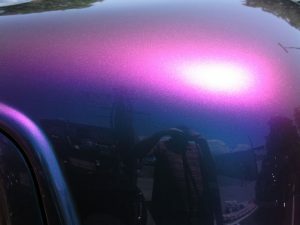 One combination I saw and loved on a client’s car was a Fire Engine red Camaro that had been custom painted with our violet spectre pearl over the top. Another combination that I have known people to use is the custom painted Purple Kandy as a base coat, with the Red Spectre pearl painted over it. Both combinaitons turn out great. With the amount of material that you will need to produce these effects, you can easily do an entire car with less than $100 dollars of our products, and a couple hundred dollars worth of chemical binders, topcoats, and reducers. We have noticed one instance in which warm colors look good on top of cool colors. 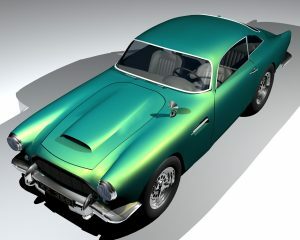 The use of green or turquiose always looks good in combination with each other. Yellows and greens look good together in almost every custom paint combination you can think of. We even carry a chameleon that is a yellow to green flip effect, but here is another effect that we like. Using green as your base coat, use gold spectre pearl over the green for an effect like this. For some, the strange and obscure, or (what grabs the eye) is the way to go. Here you can see that we have people that we work with of all types. A color combination that we never would have thought could look good (but actually does). 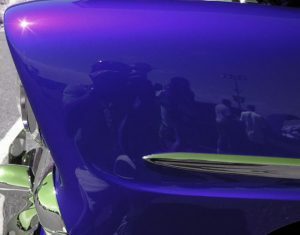 Violet Satin Spectre Pearl on top of a turquoise base coat? I never would have thought about that as cool custom paint. You be the judge.